For detailed information about The Loyal Edmonton Regiment today and how you can join us, go to the Serving Battalion section of this site. As the name suggests, LERAC is there to advise the CO on unit non-operational matters such as regimental traditions, social functions and community involvement. It is also responsible for holding and managing any funds raised and held for the use of the Regimental Family. Primarily for that reason, LERAC was set up as a registered Society with the Province of Alberta and as a registered Charity with the Canada Revenue Agency (CRA). This was done in order to lock in an established set of objectives or guidelines which ensures that any funds held are used for the benefit of all elements of the Regimental Family both now and into the future. LERAC consists of representatives from all elements of our Regimental Family. The unit is represented by the CO and the RSM and the senate, association and museum each have a representative. The Honourary Colonel and Lieutenant Colonel are also members giving the council a total of seven voting members. To provide additional input, the senate, association and museum are each permitted one additional non-voting representative. This structure ensures that all the various elements of the Regimental Family work together for the benefit of the family as a whole and that they have direct input into decisions that affect that family. The function of the Regimental Senate is to be an advisory body to the Regimental Family and the Commanding Officer and to provide support for the long-term “Regimental” affairs of The Loyal Edmonton Regiment. This includes Regimental affairs that will affect the serving Battalion and Regimental Family during and beyond the term of the presiding Commanding Officer. In November of 1916 Colonel Griesbach, CO of the 49th Battalion, wrote from the battle field in France to suggest that a Forty-Ninth Regimental Association be formed for three purposes – to welcome home returning members of the unit, to advise them on such matters as pay and pensions and to assist them in re-establishment in civilian life. In February of 1917 a local group wrote back to say that a regimental association was being formed. Over the years the association has brought veterans of the Regiment together for annual dinners, church parades and Remembrance Day ceremonies. The association also took on the task of publishing the Fortyniner magazine. 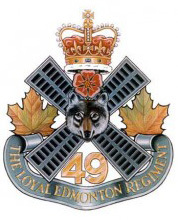 Today the 49th Battalion, The Loyal Edmonton Regiment Association is dedicated to promoting good fellowship and Esprit-de-Corps within the Regimental family and maintaining interest and liaison with the Regiment. The association still holds an annual dinner, publishes the Fortyniner magazine and now also manages the Regimental Kit Shop. It also administers a charitable institution which, among other things, provides educational bursaries to members of the unit and the association, their families, as well as to the general public. The Regimental Kit Shop is located in the unit lines at Jefferson Armoury in Edmonton and offers a range of products of interest to unit members, past and present. Items include regimental accoutrements (buckles, buttons, cap badges, etc. ), clothing (T-shirts, vests, sweat suits, etc. ), jewelry (broaches, lapel pins, cuff links, etc.) and more. Go to the Association website for contact and membership information, upcoming events, and kit shop products, prices and ordering information. The museum web site contains information on our collection and the services that we provide. It also has a detailed history of the Loyal Edmonton Regiment and of the Canadian military in general. For more detail and contact information, visit The Loyal Edmonton Regiment Military Museum.